Don't look to credit for confirmation of yesterday's unprecedented intraday reversal out of Treasurys and into stocks. 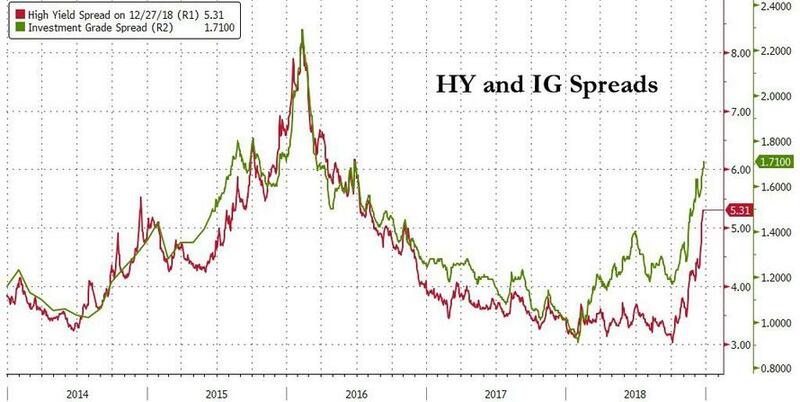 While the S&P staged its biggest rebound since 2010 on the heels of what would eventually become the 4th biggest buy order in history, US credit spreads, which have blown out this quarter, widened even more to the highest levels since the summer of 2016 amid accelerating credit funds outflows. As shown below, investment-grade bond spreads widened 3 basis points to 171bps on Thursday, having widened every day since Dec. 14 and most trading sessions this quarter, confirming that the recent stock purchase has not been a universal change in moody but a stock and Treasury specific reallocation trade even as credit has continued to get pounded. 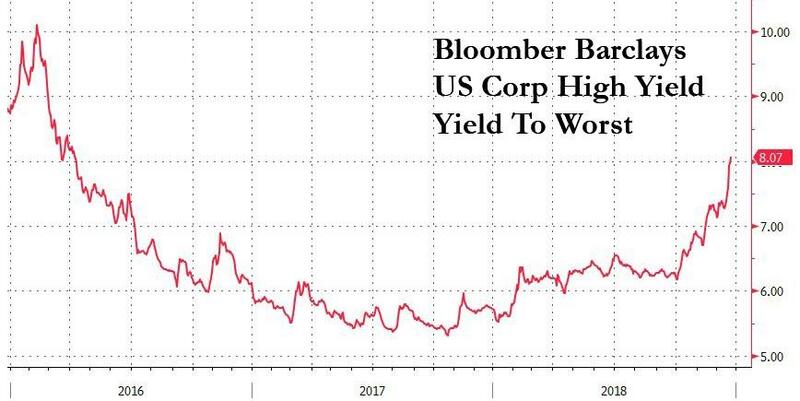 ... with the average junk bond yield now above 8% for the first time since April 2016. The reason for the continued blow out? accelerating liquidations to fund redemptions and outflows from credit funds, with Lipper reporting that investment-grade funds saw outflows of $4.4 billion for the week ended Dec. 26, while junk bond funds registered the biggest outflows since October. TL/DR: someone, somewhere is buying stocks, but this is far from a universal shift in sentiment because unless credit spreads tighten, it will become prohibitively expensive for companies to issue bonds and fund stock buybacks in 2019. As a reminder, buybacks have been the single biggest source of equity demand not only in 2018 but every year since the financial crisis.